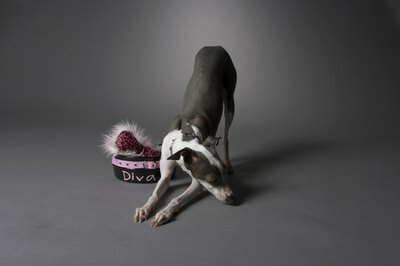 Even spoiled diva dogs need flea prevention and removal. If your furry friend has some black eggs hidden in her hair, you'll want to remove this unwelcome addition immediately. The black balls are actually not eggs but rather excrement left behind by fleas. Remove these droppings, and the fleas that caused them, with flea removal and prevention. Bathe your dog using a flea control shampoo approved by your vet, completely soaping your pet's coat and then rinsing clean with lukewarm water. Comb a flea comb through each section of clean wet fur, pulling any remaining black particles out of the fur and rinsing them off in a small tub of warm water as they collect in the comb. Move through your dog's entire coat in this way to ensure all the black flea droppings are removed. Rinse your dog again, and then towel-dry or allow her to dry naturally. Apply or administer a flea product recommended by your vet. The product your veterinarian recommends will vary based on the state of the flea infestation, your dog's age, your dog's health and other factors. If your dog is in the throes of a full flea infestation, your vet will typically recommend a "Spot On" topical product or an oral anti-flea medication that will kill adult fleas as well as flea eggs and larvae. If your pet is not currently infested with adult fleas, the vet may recommend a topical Insect Growth Regulator only -- one that kills eggs and larvae but not adult fleas. Apply or administer flea prevention products recommended by your vet in the proper intervals. Normally, flea prevention treatments are given once monthly, and they should always be given in a timely manner to prevent a new flea infestation. To help prevent future problems with fleas and their droppings, change your dog's bedding on a regular basis. Vacuum the carpet, chairs, beds, couch cushions and flooring in your home as well. Regular vacuuming can eliminate as much as 30 percent of flea larvae and 60 percent of the eggs living in your carpet. Replace your vacuum cleaner bags on bag-style vacuums one time each week because fleas can live inside the bags and potentially cause another infestation in your home. Do not use any new flea control or flea prevention products without checking with your vet first. Some breeds have sensitivities to certain flea control product ingredients, so it's important to make certain you are using something suited for your dog's breed. Is It Bad to Crack an Egg Into Your Boxer's Food? "How to Get Rid of Fleas on Cats, Furniture & Carpet"
Are Flea Eggs Visible on Coats of Cats?